Still Life - on this week! Still Life - on this week! Have you booked your tickets yet? 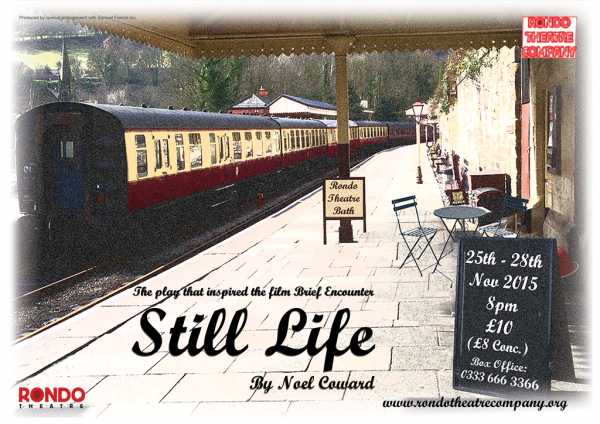 Show week is finally here and we cannot wait to unveil our autumn show, Still Life by Noel Coward. If you have not heard of it, you may know the story as it is the basis for the film Brief Encounter. We are really excited about what promises to be an excellent production. Still Life opens this Wednesday and runs to Saturday, at the Rondo Theatre in Larkhall. Note the production starts at 8pm. You can get your tickets by calling 0333 666 3366 or via the website www.ticketsource.co.uk/rondotheatre. Our exciting new family show for Easter! Auditions are truly open to all, as there are no age or gender constraints to the roles in this devised piece. Do contact Liam if you have any questions. If you are interested in auditioning or have any questions about the show, please don't hesitate to get in touch with Liam Wyatt at [email protected] or on 07974 211204.